Claymation – I say. Essay. Assay. ऐसे. Now presenting the last of the first batch — I promise :) — of my once upon a time (circa 2006) wannabe attempts at claymation (but is actually only stop-motion animation). Don’t worry I am not going to subject you to another camera technique Ekta Kapoor popularized in India — the mother-of-melodrama rapid zoom-ins-and-outs! So instead of letting that go waste, why not subject you, unsuspecting readers to some of my early forays into claymation. Strictly speaking this is not claymation — just stop-frame animation of clay figures. Maybe the first few rungs of a tall ladder, I never did climb! In this particular case, the camera remains constant but the subject is moved around 360 degrees. In an earlier film I had tried another technique — where the camera is moved around 360 degrees while the subject remains constant at the centre of the circle. Best seen in Matrix and Mission Impossible. 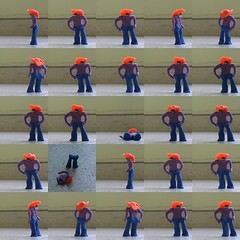 I had gathered a lot of video shots during my initial experiments with claymation. While the magnum opus is still at a story-board stage, I decided to put to use some of the ‘spare shots’. A lot like mothers (or like that guy on MAD TV on Pogo) who conjur up by-products out of waste pieces of cloth and other material. Here I tried a hopelessly dummy-stamped rendition of a popular modern-day camera technique. I would be flattered if anyone figures out what technique is being talked about. And of course this is not pureplay claymation either. That’s reserved for the magnum opus, remember! "…a raw, powerful story of two young men, a Wyoming ranch hand and a rodeo cowboy, who meet in the summer of 1963 sheepherding in the harsh, high grasslands of contemporary Wyoming and form an unorthodox yet life-long bond — by turns ecstatic, bitter and conflicted…"
Times are changing, and he (sheriff BarClay) must stand up to the winds sweeping his surroundings. How he (sheriff BarClay) ends up being a victim of his own disbelief and 'rigidity' is the essence (eh, sense?) of this film.